Igloos on the Bobby Hotel Rooftop. Click photo for link to purchase a ready made igloo kit. 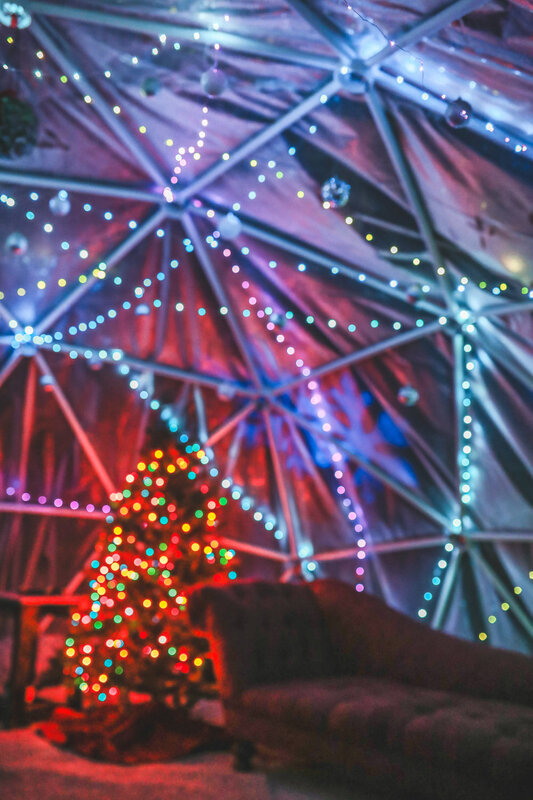 Igloos on rooftop bars have been popping up all over the place this past year, and their popularity just continues to grow. On a recent getaway weekend to Nashville to see my sister Colleen, we went to the Bobby Hotel rooftop to enjoy some hot cider and cocoa drinks. The igloos can fit 6-8 people comfortably sitting, but if you are tall you can’t really stand up in them that easily. 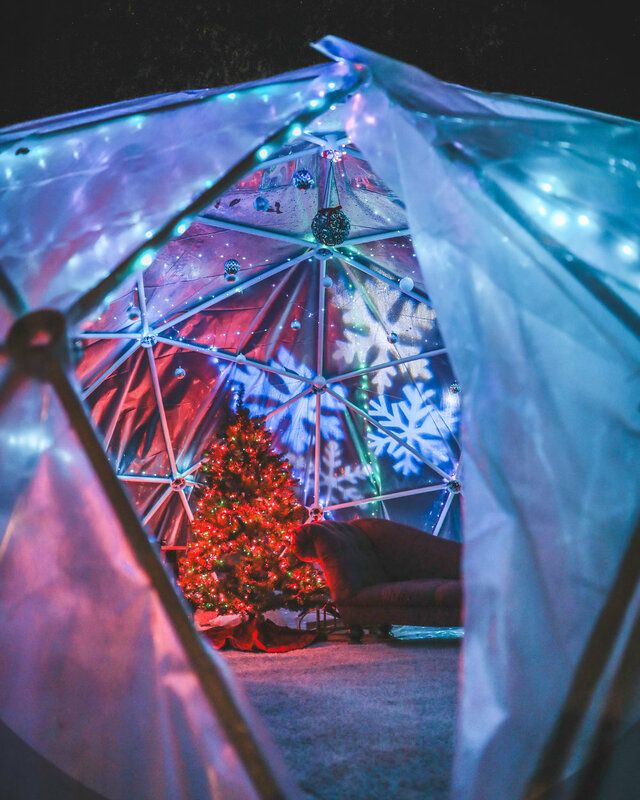 So we researched how to build a large scale version, and got to work building a 20-foot diameter igloo that could fit my giant family in my parents back yard for the holidays. I was giddy with excitement thinking about all of the fun we were going to have in there, and for all of the fun photo and video shoots. After doing some research, we found this fantastic site - ziptiedomes.com - that made everything so dang easy with their patented design and software that calculates the dimensions for you! We decided to order the 3v 3/8 dome “hubs only” kit. Then we got to work creating the struts ourselves from PVC pipes that would build a twenty-foot diameter igloo. And by ‘we’ I’m sure you can guess it was really mostly Mitch. My contribution was marking the struts then handing them off to Mitch to cut and drill holes in. When we arrived in Iowa and started to set up, my Uncle had stopped over with my cousins, and gave me the “you are building an igloo?” while simultaneously giving me the ‘here she goes again being crazy’ look. He initially said he’d only stay for about an hour to help. Well that quickly turned into the entire afternoon because everyone had a blast setting it up/ putting it together. When will my family realize that I have really ridiculously fabulous ideas!? Set up time was about two and a half hours. Including adding the cover, which was two 20ftx20ft pieces of 6mm polyurethane sheet, taped together in the middle, then thrown over top. We tucked in the excess underneath the edges of the igloo. You can watch the entire Instagram highlight story of the build process HERE. One of my favorite moments in the igloo was getting to shoot a wedding anniversary! I had the honor of capturing Stephanie and Ryan’s snowy wedding a year ago New Year’s Eve weekend, so it was so fun to celebrate their 1 year anniversary in the igloo. They ate their cake, toasted each other with champagne, and danced to their first dance song together. They also read their wedding day letters, as well as letters they wrote to each other for their 1 year. They are keeping the letter in a memory box, to read and enjoy every anniversary. (cutest. thing. ever.) Watch the video below! Excited to make this a yearly winter tradition! What do you think? Would you build one?